Home EUROPE DEALS One-day trips to Copenhagen for a fantastic £10! 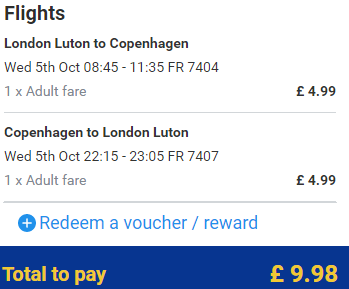 Cheap flights from London Luton to Copenhagen for just £9.98 return with Ryanair. The Irish low-cost airline offers as many as four daily flights between Luton and the Danish capital, which means that you can hop over to Denmark for just one day – leaving in the morning and returning in the evening, and without having to spend the night! You can book your flights via Ryanair.com. Tickets include two pieces of hand luggage. Next articleCheap flights from London to Luxembourg for just £14 return!